The sweetness of their scent, the softness of their skin – there’s nothing quite like holding a baby close to calm a spinning world. While we’re often told the benefits of babywearing for mums, there are just as many pluses for babywearing dads too. 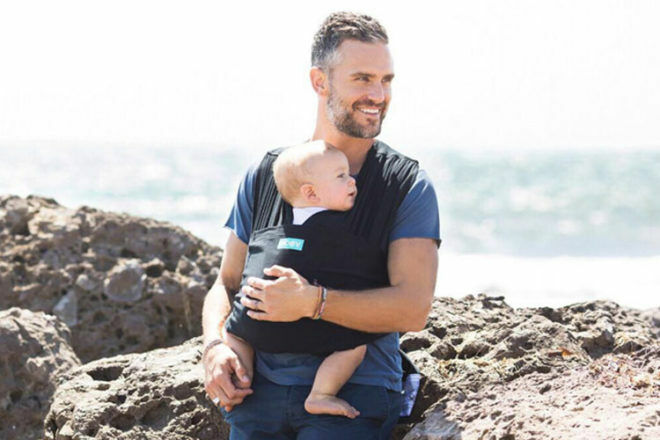 Mum’s Grapevine babywearing expert Brooke Maree says rockstar dads who choose to babywear are not only helping themselves adjust to parenthood but benefiting their partner and their new bub. Babywearing dads are legends and when carrying their child they are simply being fathers, nothing less. But if your man’s a bit apprehensive, it may be coming from years of conditioning as to what role a dad should play with his children. Dads, more often than not, are expected to man up, go to work, earn the money, come home and be nurtured by the mother of the house. While these roles can be true to an extent, they do not work when they are completely black and white. And on the other hand here, women aren’t pottering around doing light errands with the help of many hands in the village like it once was. Modern mothers have more on their plate more than ever before. We are expected to do so much with ‘burn out’ and empty cups becoming our new normal. So we are also in a place of needing our men to come home from work, or on their weekends, and be emotionally and practically available to us and our children, not just tough macho men. Adjusting to being a father can be tough. About 10 per cent of new fathers are affected by some kind of mental illness, though we know this number is likely grossly underreported and in reality much higher. The strain on a father’s mental health can come on for many different reasons. It could be the life-changing event of having a baby, those with past mental health illness, relationship strains, low-income families, and the pressure to now, more often than not, be the sole provider, or main provider for the young family. Some inner turmoil can also develop in dad’s if they personally feel slightly excluded from the strong, and unique bond that forms and continues to develop between mother and baby. There are many ways to assist parents who are dealing with mental health concerns and one practical and significantly positive solution for new fathers is actually through the use of a baby carrier. When dads are able to connect with their child through babywearing them, they get to enjoy a rush of oxytocin, the feel-good hormone, helping to build feelings of love and connection. Oxytocin also helps to reduce anxiety by reducing the level of cortisol throughout the body so this is great for those men who are often stressed or uneasy. When a dad is able to soothe his child through the use of a baby carrier and see that his child trusts and adores being with him, it gives dad a huge sense of fulfilment and enjoyment and really helps to boost his confidence in his new role as a parent. Most dads have limited time to spend with their children because they are generally the sole providers who work long hours away from the family home. This may not be true long-term, but for the first few months, this is quite common. Luckily our children are quite resilient little creatures who still thrive when they spend a good amount of QUALITY time with their dad. With children, it’s not always the quantity of time spent with them but the quality that can mean the most. This is where the benefits of using a baby carrier are enormous! 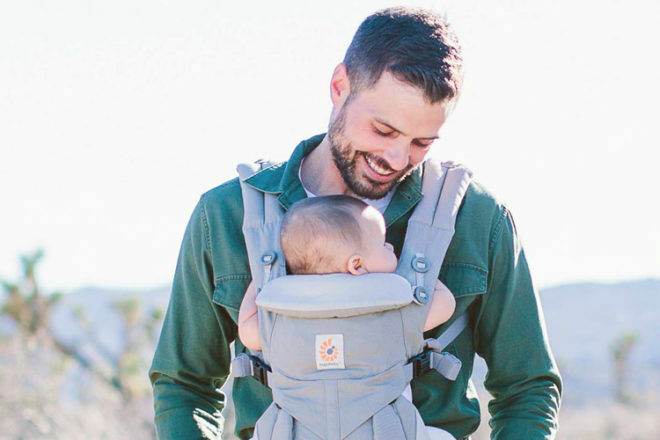 Using a baby carrier provides ample opportunity for a father and child to really connect with each other on a deeper level. When carrying a baby or child you have the opportunity to talk with them closely, naturally caressing them often and leaning in every now and then for a kiss. Carrying them so close means responding to them as they need and having the wonderful opportunity to just be fully present in the moment with them. Using a carrier will of course also let dad have his hands free, meaning he can attend to other children, give mum a break, go on big adventures, or just complete day-to-day shopping trips and errands more practically. 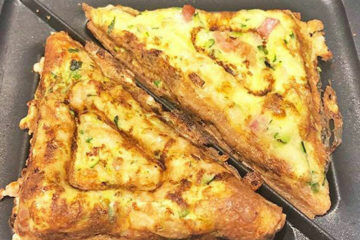 When a dad connects with his child through carrying them, the benefits don’t just stop at him. A world of benefits extends to the child, and in a different way than if it was mum who was babywearing. Dads generally parent in a different style to mothers, they speak and interact differently with their child and this actually provides great balance to a child. If mum is dealing with postnatal depression or anxiety, then for the child, having dad carry them and provide a secure strong attachment and bond can mean the baby/child doesn’t miss out on receiving meaningful positive interaction from one parent. The benefits also extend to mum and future generations. If dad is able to help with the load of life in the household by carrying his child, mum is going to benefit from the support and therefore feel better as a woman and as a mother. Also if older siblings see dad carrying the younger baby, this can influence their own parenting by seeing mum and dad as having balanced roles in providing positive attachment relationships. 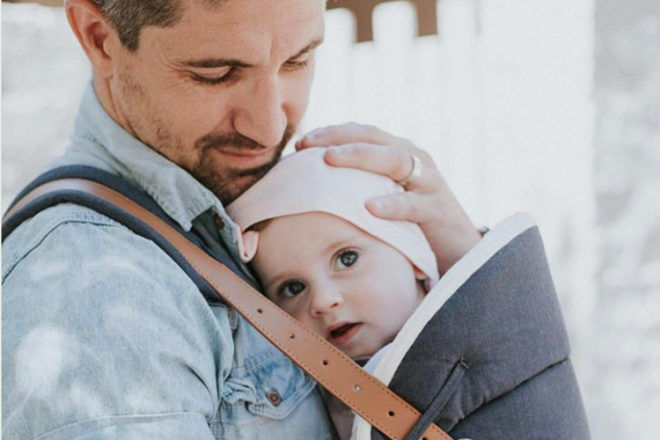 What carriers are best for babywearing dads? So what carriers suit dads? Well, of course, they can use whatever they like to safely carry their child, but generally, dads will lean towards buckle carriers. These quickly clip on and off and don’t require much fiddling around. That’s not to say fathers don’t use other styles. Many dads enjoy babywearing with a stretchy wrap too and those cuddles seem to be extra special because they are so snug and close with their baby. It’s personal preference here, there’s not one style that’s better or worse for dads, and the same goes for mums and other caregivers. Buckle carriers such as ErgoBaby, Tula, Manduca and Soul AnoonA seem to be the most popular choice cause they are simple, basic, and resemble a backpack. Fathers who choose to use a baby carrier are legends! 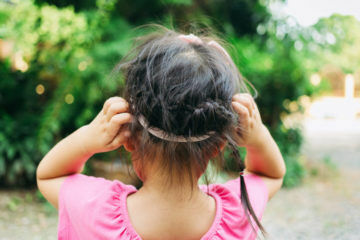 They are providing such a lovely opportunity for their child to feel safe, secure, and connected, and this is so important in the healthy emotional development of a child. Children presented with healthy attachment relationships are given a solid foundation on which to thrive as they grow. And through the use of a baby carrier dad now has his hands-free for big adventures – WINNING! If you see a dad carrying his child, give him a big thumbs up, he deserves it. If you’d like to find out more about babywearing, we have other articles from our babywearing expert that you may like to read next. Brooke Maree is a Babywearing Educator & mother of two based in Brisbane. She is passionate about parents finding joy and confidence in their roles by using a baby carrier or sling to make their lives easier. An expert in her field, she provides educational blogs, video tutorials, a monthly podcast, private consultations and workshops. Find out more about her services at Brooke Maree.